Today is the second of a two-day theatrical performance by Clark Honors College students to help preserve Eugene’s Civic Stadium. 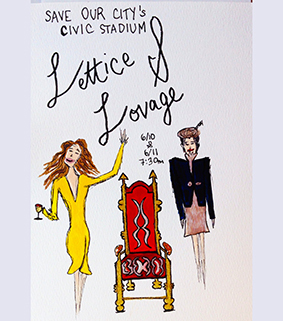 The group will present a benefit reading of Sir Peter Shaffer’s award-winning comedy “Lettice and Lovage.” The reading is tonight at 7:30 p.m. in the UO Pocket Theater of Villard Hall. The idea sparked from a student-designed-and-led seminar about Art and Politics by Maggie Witt, art history major, which led to the collaboration by Barbara Mossberg, professor of practice for the Clark Honors College, with John Schmor and Janet Rose from the theater arts department. The Eugene School District currently owns Civic Stadium and its 10-acre property; the district recently evaluated proposals to buy or lease the property. The City of Eugene’s proposal was selected and the city is now working to raise $3 million by September for the property. A local organization, Friends of Civic Stadium, is heading the fundraising efforts with help from many smaller groups and organizations. “I love this message, how our students, with everything going on in their lives, are stepping up to the plate to try to make a difference,” said Mossberg. Entry is free to the performance; all donations will go to the Friends of Civic Stadium. “I hope money is raised, but even more importantly, that our fellow citizens know our future is in good hands, good minds, good hearts: the next generation on whom we utterly depend,” she said.